'Seneca Prissy Miss' ( Dana Borglum, R. 2006). Seedling #BB05. BB, 23" (58 cm), Midseason bloom. 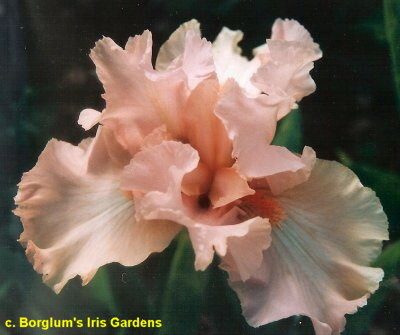 Standards and style arms peach pink; falls lighter peach-pink fading to white at center; beards bright orange; ruffled. Parentage unknown.